After many project applications by Ricardo de Paula in 2009, the solo Register was approved. However, the Pankow and Prenzlauer Berg districts of Berlin saw their budgets reduced and the sponsoring was again denied. So emerged a very persistent question: “How much does dance cost”? Without the money to produce the piece, the support of a big institution or the mediation of a cultural manager, Grupo Oito chose to produce directly with the audience. The tent, located in a public area, is symbol of autonomy from the institutional art spaces. Lacking the support of the state, which should guarantee the right of everybody to participate in the cultural life, Grupo Oito did not give up and delivered the show. Dance for Sale researches dance as a product. The “business with art” is the focus of its choreography. In Dance For Sale, Grupo Oito invites the audience to a dance market and leaves them in a space negotiating the price of art. Not only for sale, but also à la carte. 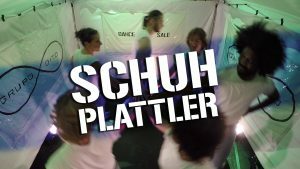 The menu has about 20 varieties of solos, duos, or little phrases with up to four dancers. The principle is simple: those who get inside, watch and decide how much to pay. The rest stay outside. The adaptation and renewal is a central part of the concept, keeping the same structure, the dances performed inside the tent and people involved are always changing. 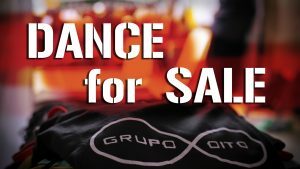 Welcome to Dance for Sale YouTubeChannel, a new platform and a new social experiment of Grupo Oito! 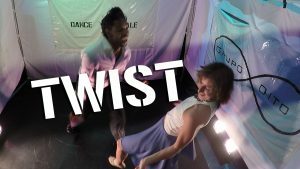 Examining the logic of subsidies and the dance market, the performance “Dance for Sale” has been so far questioning dance as a product and putting the spotlight on the question “How much dance cost?”. This online version wants to take this research further, connecting the online and the offline world. The value and means of exchange assume other forms, but yet question the value of dance. Every Tuesday at 7 pm a new video will be released. Stay tuned, subscribe, watch, like, share and follow us! How much is dance worth to you ?? ?